This 50-prep system kit isolates and purifies genomic DNA (gDNA) from whole blood. The kit is uses Solid Phase Reversible Immobilization (SPRI) paramagnetic bead-based technology to effectively produce a high recovery of high quality DNA for downstream applications such as PCR. SPRI beads allow for fast separation, easy manipulation and simple automation compared to traditional centrifugation and vacuum filtration technologies. The size of this kit is amenable to high throughput applications processing 50 samples of 200µL of whole blood and 192 samples of 400µL of whole blood. 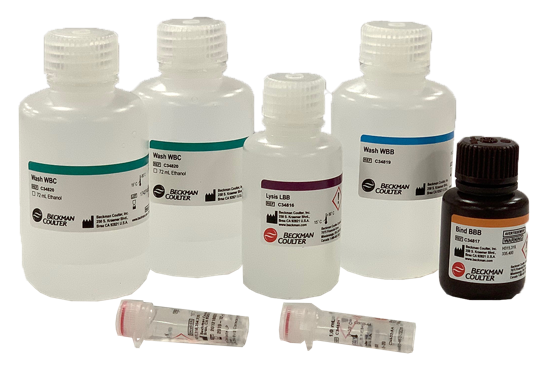 The method can be run manually in a 2-mL tube format or a 96-well format, or automated in a 96-well format on a variety of Beckman Coulter Biomek liquid handling workstations. Not what you are looking for? Review additional GenFind V3 information and products, or find other DNA isolation kits and information.